Here is creative way to experience a traditional food with an international flair. Created by five-year-old Aspen and her mother. Bring the quinoa, 2 cups of water and salt to a boil. Lower to simmer, cover and cook for 15-20 minutes, or until all of the liquid has been absorbed. Let it cool. Grind up the flax seeds in a grinder and set aside. Shred the carrots and zucchini. Set aside. Slice the strawberries and set aside. When the quinoa is cooled enough to handle, squish in the banana with your hands or with a spoon. Add the vegetables and flax seed. Place a nori sheet, shiny side down, on a bamboo sushi mat. Dip you hands in a bowl of water and then take a large handful of the quinoa mixture. Gently pat it on to the nori sheet, spreading it evenly. Leave about 1/2 inch of nori quinoa-free. 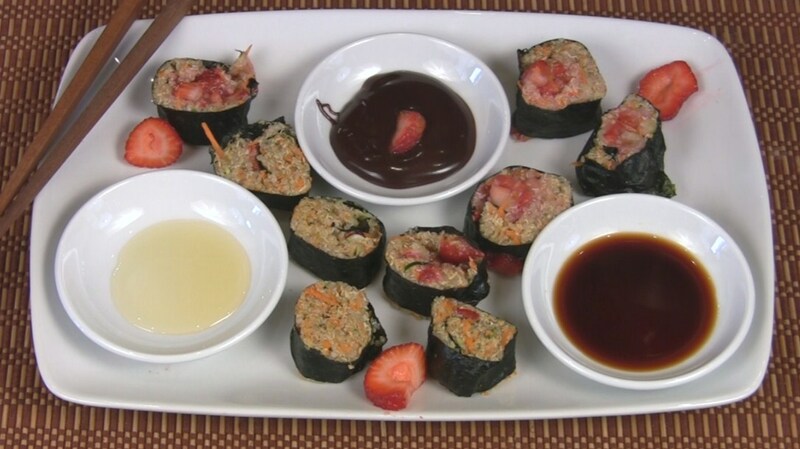 Top with strawberries and roll - gently but firmly - using the bamboo mat to form the roll. Wet the end of the nori so that it will stick together. Slice with a very sharp knife - this will ensure that the roll will keep its shape and keep the ingredients from squishing out. Serve with chocolate, agave or tamari/soy sauce.